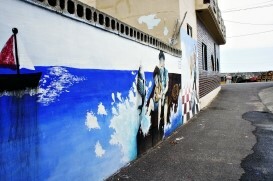 Everyone knows the fishing village of Eupcheon as a place for viewing painted murals. When I heard there were other new attractions to be seen, I made tracks there at once. 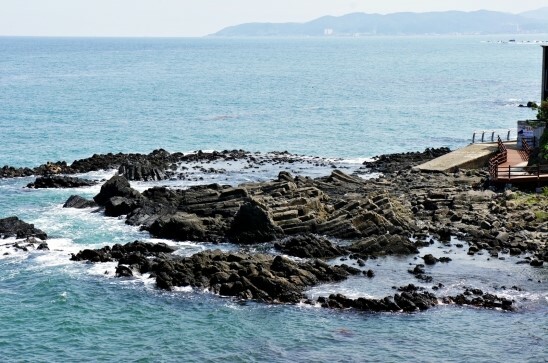 After a nearby military base was decommissioned, some rock structures exhibiting columnar jointing became publicly accessible. 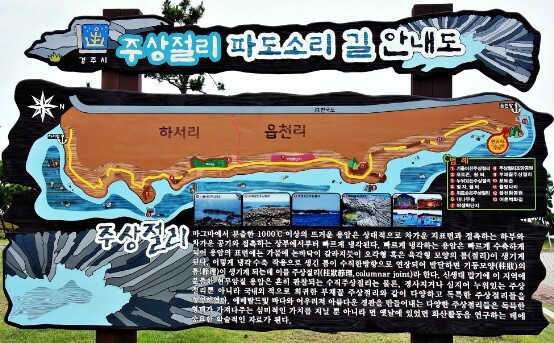 A coastal walking course called “Pado-sori-gil” (“sound of the waves” trail) was opened on June 13, 2012, for viewing the geological columnar jointing in Eupcheon. Presently, a 1.7-km stretch of the trail has been rigged up, waiting to amaze visitors. 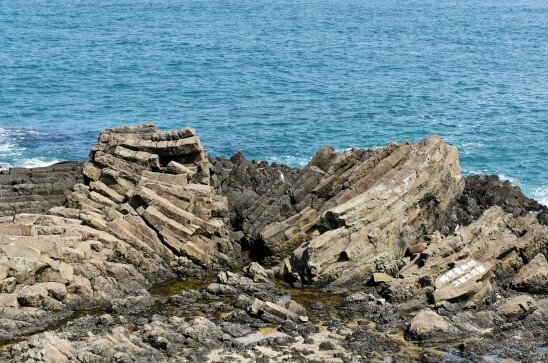 You can see all kinds of columnar jointing there. To start with, you can’t miss the fan-pattern columnar structures, arrayed like an open fan, horizontal columnar structures lying on their sides, and vertically rising columnar structures. 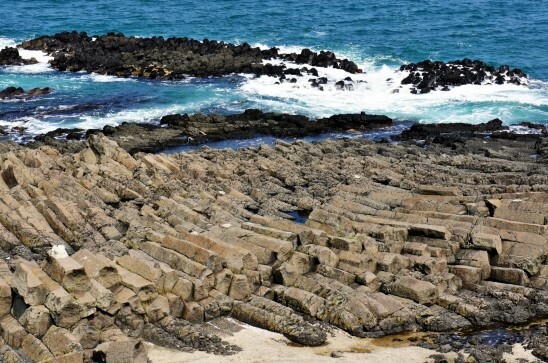 You might think that viewing the columnar structures in Eupcheon would be even more spectacular with waves crashing against them. 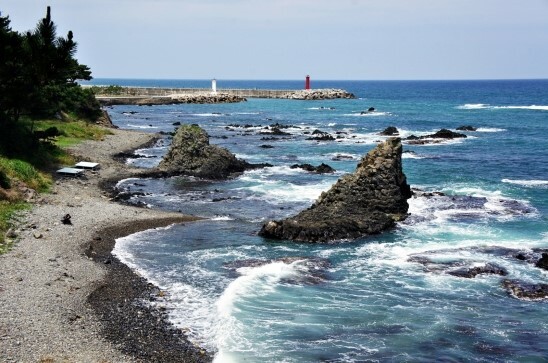 But the day I visited Eupcheon, though the ocean breezes were blowing only gently, and the waves breaking on the beach were neither high nor low, still I found the scenery a feast for the eyes. 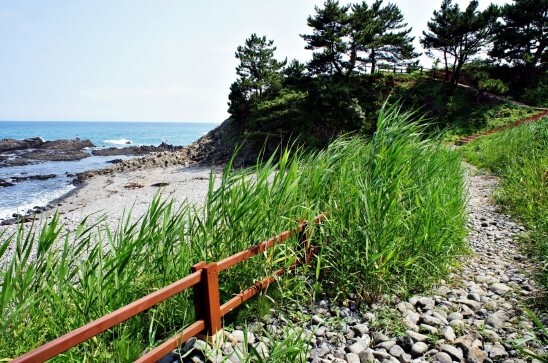 Here is a detailed guide to the coastal walking course. 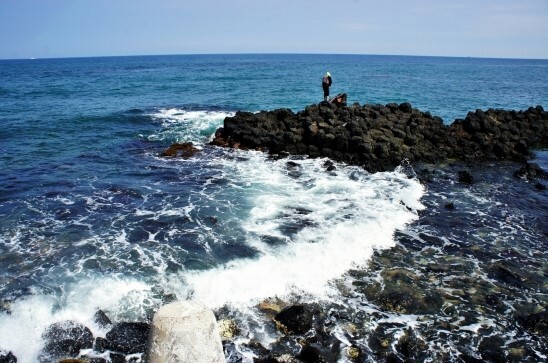 Walking on ‘Pado-sori-gil,’ enjoying the beautiful song of the surf softly caressing the pebbles as the waves lap at the columnar structures... Three or four hours should be plenty of time to walk the whole 1.7 km coastal course and back again. 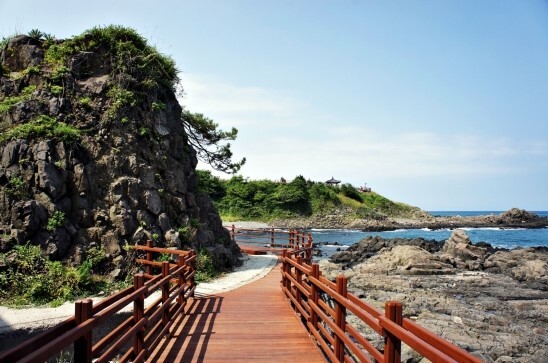 The path stretches from Eupcheon to Haseo, two villages located in the Yangnam-myeon area of Gyeongju. Taking a rest, having a drink, eating a snack… you don’t need a wristwatch while appreciating this masterpiece created by nature. 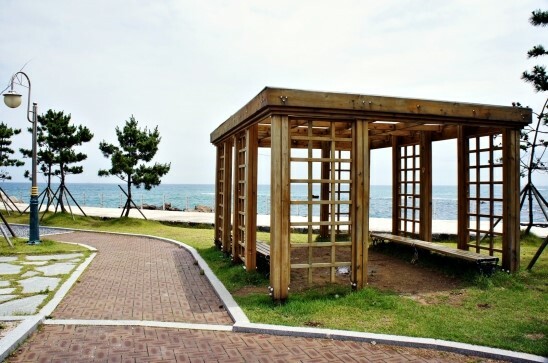 ^^ Benches and pavilions pop up along the trail just when you feel like taking a little break. Even the salt-tinged air tastes sweet. 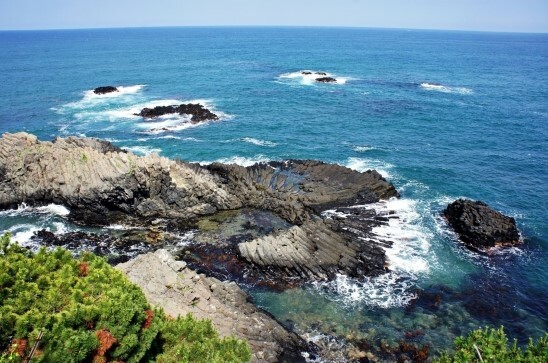 You can’t help but get the same feeling as being refreshed by a cool sea breeze on a sweltering summer day. 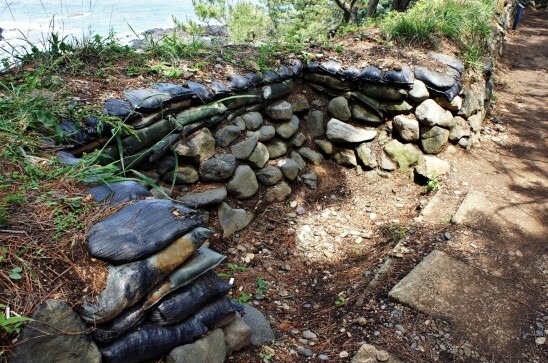 If you go hiking there, be sure to check out all the attractions along the trail. When I arrived at Eupcheon, I was greeted by a clear blue sky, as the monsoon clouds hanging around all morning had all been swept away. I pressed the shutter incessantly. That’s just the thing to do on a gorgeous day like this: snap photos like crazy. 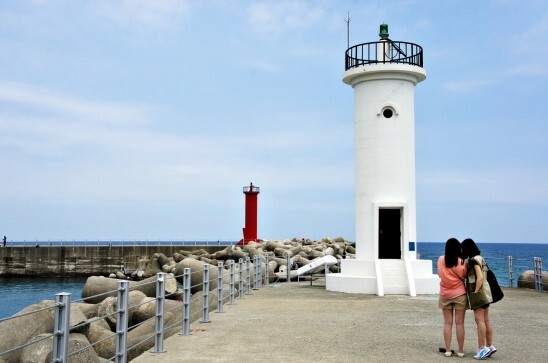 Pretty girls are snatching memories in front of a dazzling white lighthouse, and I’m capturing the whole beautiful scene. 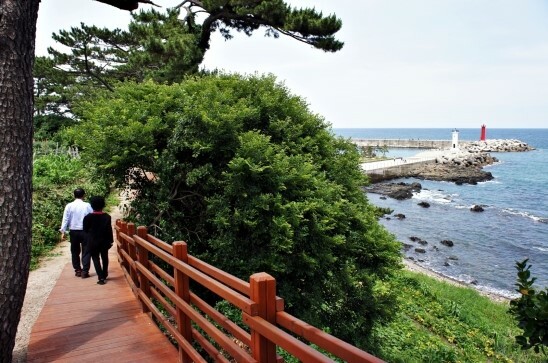 Take a quick look around the lighthouse park before heading off to Pado-sori-gil. 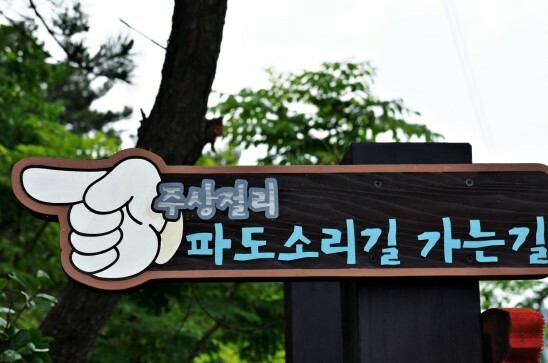 Quick tip) Stop and use the restroom in the parking area before starting on the Pado-sori-gil trail. There are no restroom facilities along the trail. Heading off to see the columnar joints. 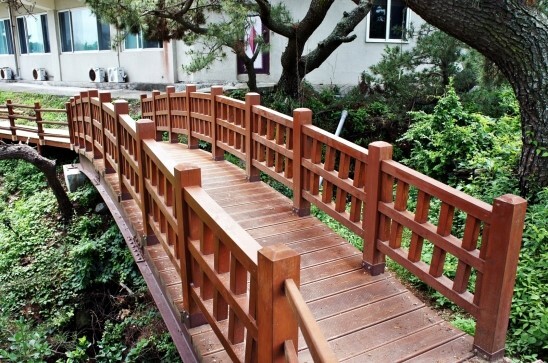 walking a path made from a wooden deck. The trail is very nicely designed, indeed. what kind of scene are they dreaming of? 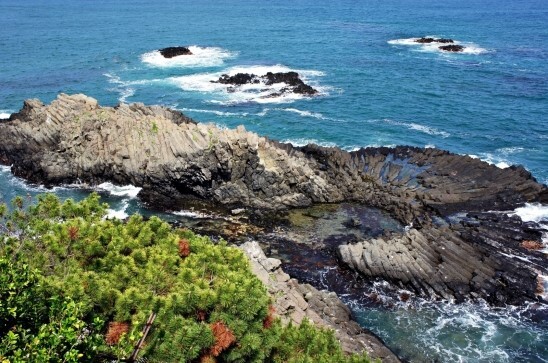 A beautiful perspective was created by this arc-shaped beach, fantastic rock formations, and clear, cool sea. 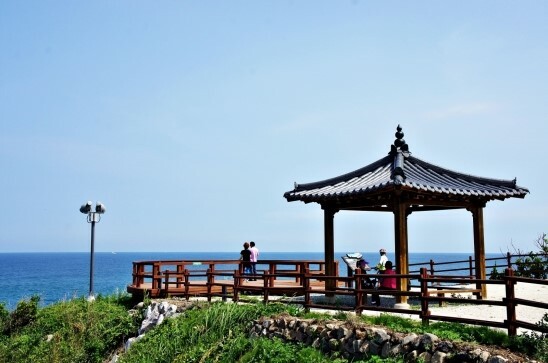 Pado-sori-gil is dotted with inactive coastal lookout posts and strongholds, left over from the military base that used to be here. Those are supposed to be gradually trimmed away. As I was heading towards the fan-shaped columnar structures, the first lookout post that I chanced upon became my own private photo zone. I reached the ‘photo zone’ scenic overlook, featuring a view of the fan-shaped columnar structures. To the southeast, you can see layer upon layer of elongated rectangular rocks stacked up, creating odd and bizarre formations. I thought this young guy was pretty daring, bravely heading out for an up-close view of the columnar joints. I captured the beautiful fan-shaped columnar structures. Actually, it’s difficult to get a complete view of the fan-shaped columnar structures from the photo zone. If you want to see a really wondrous view, it requires a little bit of recklessness, audacity, and fancy footwork. See below! 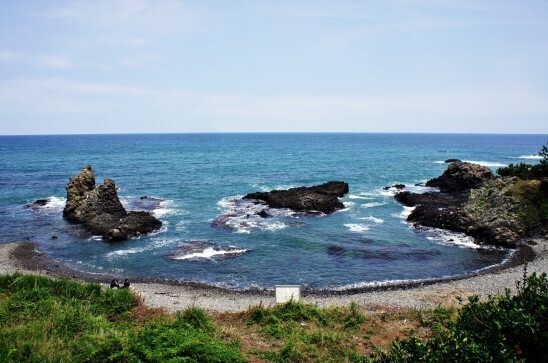 Presently, because negotiations with the military base are still ongoing, the best spot to view the fan-shaped columnar structures is still off limits and blocked by a barbed-wire fence. Down by the water, there is a place where the fence is sagging a bit. Be brave and try going over it! You can see the fan-shaped columnar joints from the lookout post shown in the above photo on the left, and also from the spot reachable after climbing the ladder in the above right photo. The view from the top of the ladder is far better than the view from the lookout post. 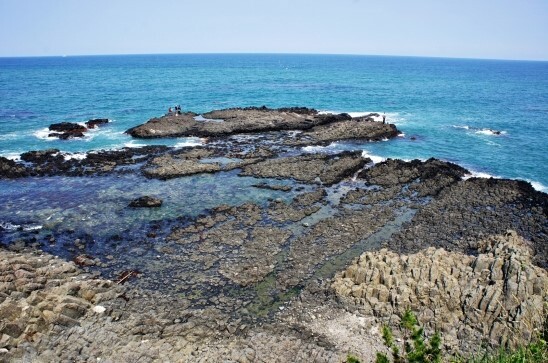 To get to the next point of interest after the fan-shaped columnar joints, you need to back-track about 100 meters. 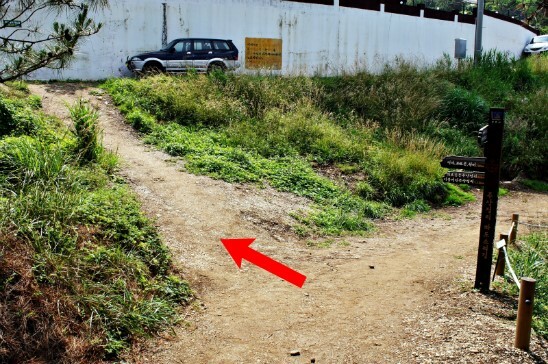 Take the left fork of the trail, following the direction of the signpost. 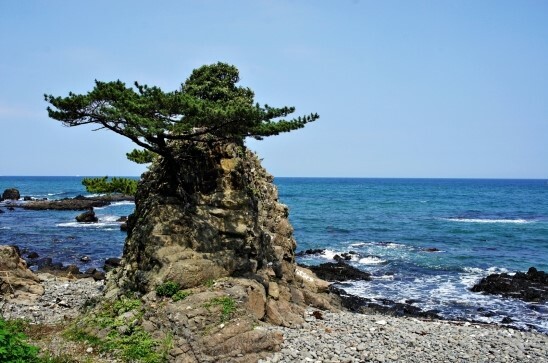 A pine tree growing atop a columnar structure—this is a work of art that could never be created by human hands. It’s a natural wonder. 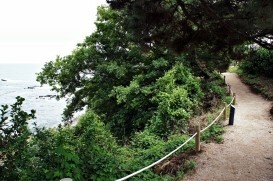 This was taken while walking on an unfenced trail right next to the sea. I exchanged warm greetings with these elderly ladies and gentlemen who had departed from Haseo port on a group outing from an agricultural college in Gyeongju. 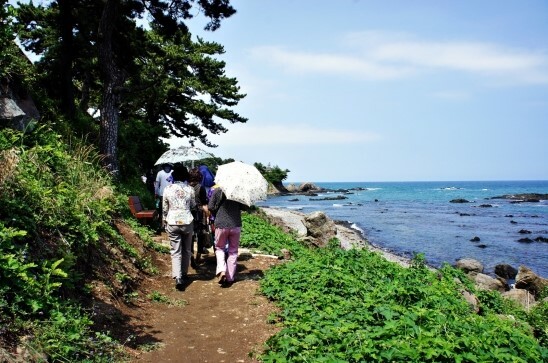 It’s even nicer to walk on this packed earth ‘analog’ trail when you combine the grandeur of the ocean with friendly greetings from these elderly folks. Now it’s time to look at columnar structures of every shape and form. 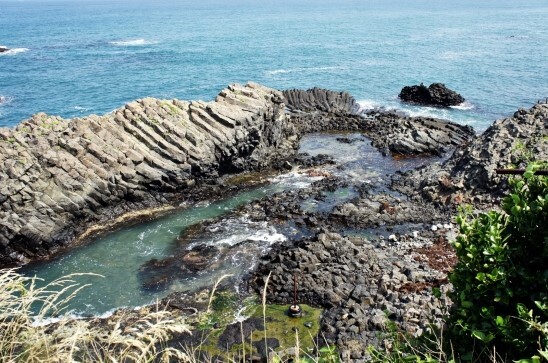 Because of the variety of columnar jointing found at this one site, Gyeongju’s Eupcheon is attracting great interest from the academic community. 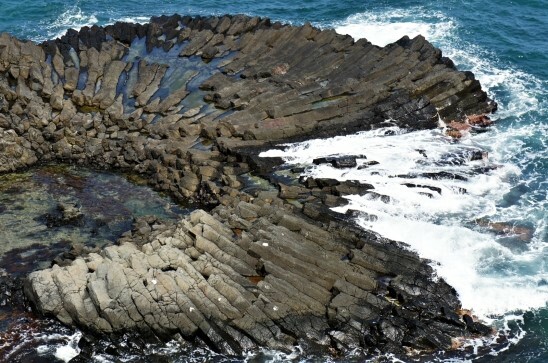 The fan-pattern columnar joints and columnar structures lying on their sides are particularly rare. 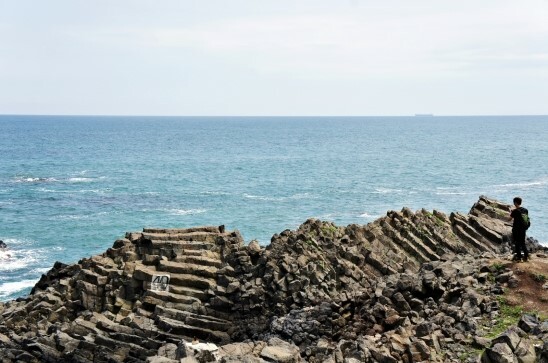 Korea’s Cultural Heritage Administration has plans to give a special designation to the area in Eupcheon where these columnar structures are found. As we take in these views, let’s treasure these precious creations of nature. 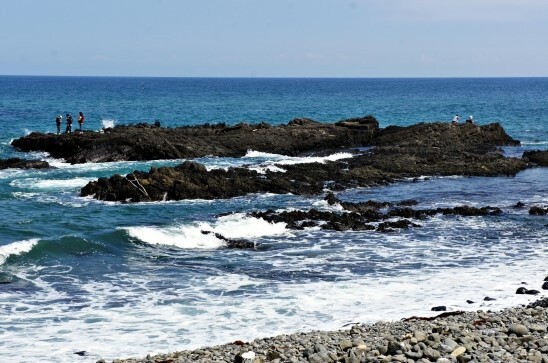 I head out to encounter the various types of columnar structures, passing a path covered with well-rounded pebbles and stones, tumbled smooth by the delicate touch of the waves. 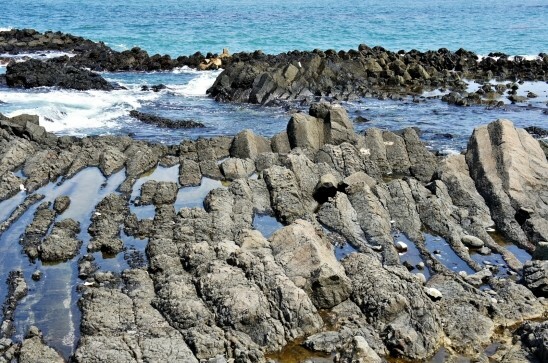 These rocks rising upward show vertical columnar jointing, and are scattered throughout this area. This shot was taken from a hilltop pavilion, an optimal place to get a panoramic view of the vertical columnar structures. Two different spots have pavilions that serve as viewing platforms for convenient views of both vertical columnar joints and the horizontal ones that are next on the course. 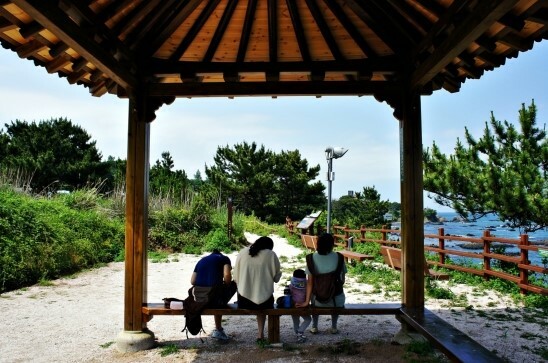 Be sure to take full advantage of the pavilions, resting and enjoying the pretty scenery. I decided to take a moment to catch my breath, sitting in the pavilion. I don’t feel like getting up again. I took my time there, enjoying the sounds of the surf. Here we are at the course terminus. 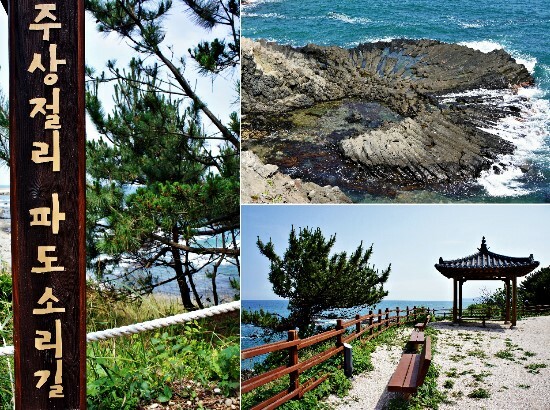 It’s in the small and cozy coastal village of Haseo. 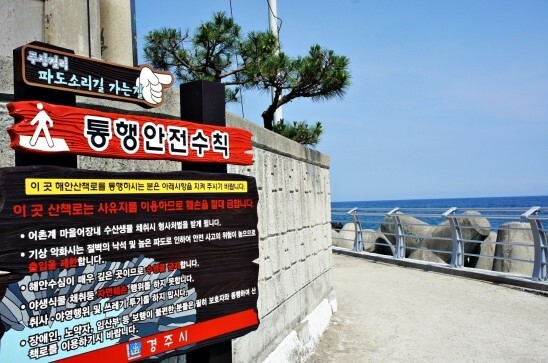 A signboard for Pado-sori-gil can be seen. This time I’ll be traveling on the return route, extending from Haseo to Eupcheon, and it’s like starting out anew on a fresh journey. TIP: This course can be enjoyed at night, too. 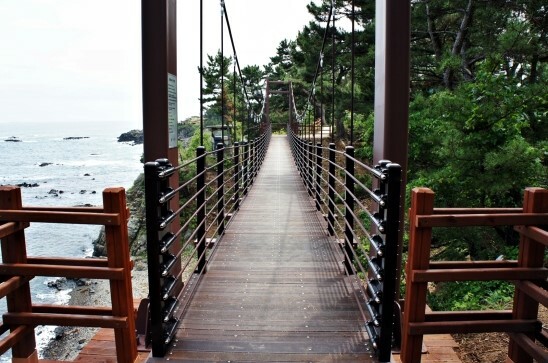 You can walk on Pado-sori-gil even after dark. Exterior lighting is turned on after sunset and remains lit until 9:30 p.m. in the summer and 8:00 p.m. in the winter. 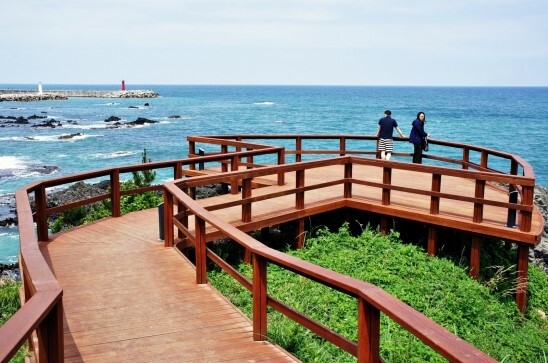 Wouldn’t this be the perfect place to go on a romantic date? GPS search: Find directions to Eupcheon or Eupcheon 1-ri Community Center.